Dolphin Neon Signs, Irish Neon Signs, Game Room Neon Signs, and More! 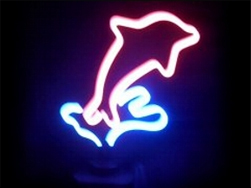 This Neon Dolphin Sign features a pink dolphin breaking out of blue water into the air. The Neon Sign measures 24” x 16” x 8” and has a base for table top mounting and an L-Bracket for wall mounting. The Dolphin Sign features a UL-Approved adapter, 3-way switch (on, off, and blinking), and 3/8" tubing. (Colors may vary slightly) Weight 6 pounds. We have many other Bar, Catering, & Restaurant Supplies, including Custom Imprinted Plasticware, Happy Hour Jar Tickets and Pull Tabs, and UV Supplies & Accessories. For a FREE Bar, Night Club, & Restaurant Supplies Catalog or more information on any of our Barware Products, please contact us at 1-800-233-0828.